Wintershall is looking back in 2019 not only on 125 years of company history, but also on a successful past business year. “In 2018 we set a production record with daily production of up to 500,000 barrels of oil equivalent (BOE). With a crude oil and natural gas production of 171 million BOE in 2018, Wintershall has once again significantly surpassed the record figure – 164 million BOE – from the previous year,” explained CEO Mario Mehren at the Annual Press­ Conference for Wintershall, Germany’s largest internationally active crude oil and natural gas producer. Wintershall also increased its reserves by 12 percent to 1.9 billion BOE – also a record figure. Wintershall replenished 214 percent of the volumes produced in 2018. The reserves-to-production ratio was increased to around eleven years. This is the ratio of Wintershall’s production in 2018 to the end-of-year reserves. “However, we’re not resting on our laurels, but are actively shaping our future in our anniversary year and are writing the next chapter in the company’s history: Wintershall DEA will be the largest independent European gas and oil company – a European champion in the best sense of the word,” said Wintershall’s CEO. “We’re convinced that it is right and important that Germany also has a powerful gas and oil company – in the same way that many of our neighboring countries also have a major player.” The European Commission already gave its approval to the merger of Wintershall and DEA at the end of February. The transaction is expected to close in the first half of 2019. Despite the continued challenging market environment in 2018, Wintershall increased its income from operations before special items (EBIT) by 155 percent, from 683 million euros in 2017 to 1,745 million euros. This was primarily due to higher gas and oil prices and higher production volumes in Norway and Russia. EBIT increased by 798 million euros to 1,733 million euros. This is a plus of 85 percent. BASF’s net income after taxes increased by 69 million­ euros (plus 9 percent) to 829 million euros (2017: 760 million euros). The merger with DEA sets the course for further growth. The new company is aiming to increase Wintershall DEA’s average daily production, which together for the two companies is currently around 590,000 BOE, by around 40 percent to between 750,000 and 800,000 BOE within the next four years. This growth is expected to come from both the existing portfolio of the two companies and the new production regions. DEA has recently become active in Mexico, and Wintershall has succeeded in entering a new oil and gas concession in Abu Dhabi. Volgodeminoil, Wintershall’s joint venture with Lukoil’s RITEK subsidiary in southern Russia, is the longest existing joint venture between a Russian company and a foreign partner and is regarded as a pioneer of German-Russian oil production. Even after more than 25 years the cooperation still exemplifies successful bilateral collaboration and joint economic success. Last year the company reached a new milestone with a total production volume of 10 million tons of oil. “In 2018 we once again increased production in our Russian projects,” said Mario Mehren. “We also want to continue this course after the planned merger and invest in expanding our projects in Russia, which is – and remains – our most important core region,” Mehren explained. Wintershall has achieved a production volume of over 100,000 BOE in Norway. “This is an ideal starting point for the new Wintershall DEA company. After merging with DEA we will be the third largest producer on the Norwegian Continental Shelf, with a daily volume of over 200,000 BOE in the next few years,” said Mehren. “However, we don’t want to rest on our laurels – we’re continuing to expand our production. Wintershall is investing around 2 billion euros from 2017 to 2020 in exploration and development in Norway,” Mehren explained. This strategy illustrates the company’s strong commitment to Norway, which will become an even more important growth region once the merger of Wintershall DEA is completed. Norway accounts for more than a third of Wintershall’s global exploration budget. In autumn 2018, the Norwegian Ministry of Petroleum and Energy approved the Plan for Development and Operation (PDO) for the Nova field, the third subsea field operated by Wintershall. Nova will be developed with two templates on the seabed. The two subsea templates will be tied back to the Gjøa platform for processing and further transport. ”This sustainable development solution is a win-win situation: Instead of building a new installation, the tie-back to the nearby platform increases Wintershall’s cost efficiency and extends the economic life of the existing infrastructure. This is how future oil production will look like,“ emphasized Mehren. Wintershall’s investment in the Aasta Hansteen field, which came on­ stream in December 2018 and is operated by Equinor, will help to secure Europe’s energy supply with natural gas. ”The field will make a significant contribution to Norway’s annual natural gas production in the coming years and thus to supplying significant energy volumes to Europe – from one of the cleanest producing countries in the world,“ said Mehren. ”Aasta Hansteen and the Polarled pipeline represent new infrastructure in the northern part of the Norwegian Sea, thus opening up new opportunities for this part of the shelf.“ Wintershall’s recent Balderbrå discovery in the Vøring Basin is estimated to be one of the two largest discoveries on the shelf in 2018. Wintershall has been active in Latin America for several decades. The company has a long tradition in Argentina where it proudly celebrated a major anniversary in 2018: Wintershall has been exploring and producing hydrocarbons here with great success for 40 years and is the country’s fourth largest gas producer. Today Wintershall is involved in a total of 15 onshore and offshore fields. The company is the operator in three of these fields. 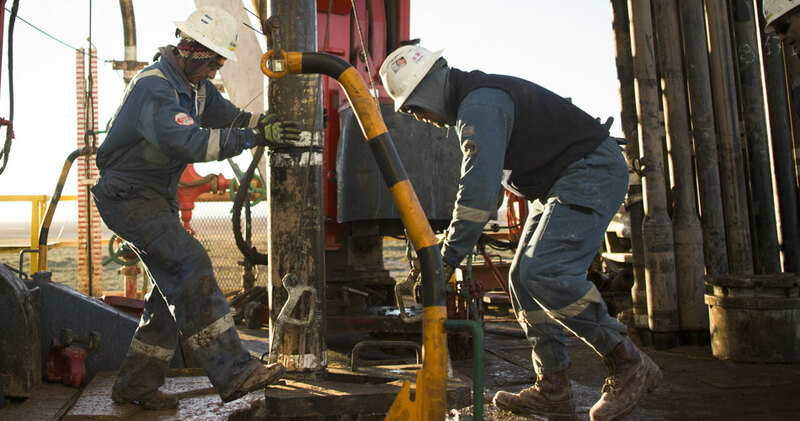 Wintershall intends to further expand its technology base in Argentina and is involved in unconventional oil and gas production in the promising Vaca Muerta shale formation. In 2018, two horizontal wells were drilled in Wintershall’s operated Aguada Federal block to further explore the shale rock­ in the formation. ”We’ve been contributing to the oil and gas industry in Argentina for decades. We have the technology and expertise to drill wells under demanding geological conditions, and with the highest environmental and safety standards,” Mehren explained. In November 2018 Wintershall took a decisive step in expanding its operations in the Middle East with the acquisition of a 10 percent stake in the Ghasha concession, alongside the Abu Dhabi National Oil Company (ADNOC). Abu Dhabi is one of the world’s most important centers for natural gas and oil production. Investments in this region represent a strategic further development and make the Middle East region another core region for Wintershall. The Ghasha concession covers the development of the Hail, Ghasha, Dalma and other ultra-sour gas and condensate fields located in the Al Dhafra region off the coast of Abu Dhabi. The agreement marks the first time that Wintershall will produce gas and condensate in Abu Dhabi, and follows the success of two exploratory wells, which were drilled in the Shuwaihat sour gas and condensate field in 2015 and 2017. Wintershall brings to Gasha the company’s more than 40 years of expertise in the safe development and production of sour gas fields. “Here we can impress with expertise from Germany. Our expertise from German sour gas fields has opened doors for us in the Gulf. And we know what counts in ecologically sensitive areas,” said Mehren. According to the ADNOC plans, the project is expected to produce more than 40 million cubic meters of natural gas per day by the middle of the next decade, enough to supply around two million households with energy. In addition to sour and sweet gas, 120,000 barrels of oil and high-quality condensate will be produced here every day. The gas produced in the concession area will make a significant contribution to achieving ADNOC’s goals of a permanently reliable and economical gas supply and, ultimately, gas self-sufficiency in the United Arab Emirates. In 2018 Wintershall expanded its technology center in Germany at the Barnstorf site in Lower Saxony (Rural District of Diepholz), where it now utilizes state-of-the-art digital technology to analyze the potential of natural gas and crude oil reservoirs worldwide even more precisely. The centerpiece of the new laboratory is a micro-computed tomography (microCT) scanner. Using the digital rock method, experts can create high-resolution 3D images of rock samples from natural gas and oil reserves. “The analyses carried out in our expanded technology center help our colleagues in Germany, Siberia, Norway or Argentina to make the right decisions when developing gas and oil reserves and to work successfully,” said Mario Mehren. Following the merger of Wintershall and DEA, Barnstorf will become the technology and training center for the joint company. Wintershall successfully completed a high-resolution 3D seismic survey at the Emlichheim site in Lower Saxony (county of Bentheim) at the beginning of 2018. Along with Völkersen and Mittelplate, Emlichheim will become one of Wintershall DEA’s core activities in Germany. The results of the seismic survey in Emlichheim form the basis for further development. Wintershall is planning to drill new wells – the first five are scheduled to start in September 2019. In the second half of the year, Wintershall also plans to begin construction of an approximately 14-kilometer-long crude oil pipeline between Emlichheim and Osterwald in order to also transport the extracted oil in the future in a safe and environmentally friendly manner to the refinery in Lingen. Wintershall has been producing crude oil at a constantly high level in Emlichheim for over 70 years. For affordable climate protection and a competitive industry in Europe, it is essential that natural gas is delivered to Europe reliably, cost-effectively and in a climate-friendly manner. The Nord Stream Baltic Sea pipeline, which is being expanded with Nord Stream 2 due to the growing demand for energy and the decline in production in the EU, will contribute to this. The capacities of Nord Stream 1 were fully utilized in 2018. “Nord Stream 2 offers up to 55 billion additional cubic meters of natural gas for the European markets. Arithmetically speaking this could replace, for example, Germany’s entire coal-fired power generation,” said Mehren. Wintershall is helping to finance the Nord Stream 2 project as a lender and will provide up to 950 million euros for the project. By December 31, 2018, almost two thirds of this amount had been released. To date, the Nord Stream 2 AG project company has received approval for the construction and operation of the pipeline system from all neighboring states except Denmark. Over 800 kilometers of pipes have already been laid. “Our plans for 2019 are based on an average Brent crude oil price of 70 US dollars per barrel and an exchange rate of 1.15 US dollars per euro,” said Mehren. This report contains forward-looking statements. These statements are based on current estimates and forecasts by the Executive Board of Directors as well as on information currently available. The forward-looking statements should not be considered to be guarantees of future developments and results. Rather, the future developments and results are dependent on a variety of factors; they include various risks and uncertainties and are based on assumptions that may prove to be incorrect. We accept no obligation, beyond what is required by law, to update the forward-looking statements made in this press release. Due to the changed disclosure of the oil and gas business in BASF’s 2018 financial reporting, the corresponding prior-year figures for 2017 have also been adjusted here and below. Includes only depreciation for the first three quarters of 2018. Wintershall Holding GmbH, based in Kassel, Germany, is a wholly owned subsidiary of BASF in Ludwigshafen. The company has been active in the extraction of natural resources for 125 years, and in the exploration and production of crude oil and natural gas for over 85 years. Wintershall focuses on selected core regions where the company has built up a high level of regional and technological expertise. These are Europe, Russia, North Africa, South America, and increasingly the Middle East region. The company wants to expand its business further with exploration and production, selected partnerships, innovation and technological competence. Wintershall employs about 2,000 staff worldwide from 50 nations and is now Germany’s largest, internationally active crude oil and natural gas producer.